In this tutorial we will introduce you to the the AURIN Workbench. 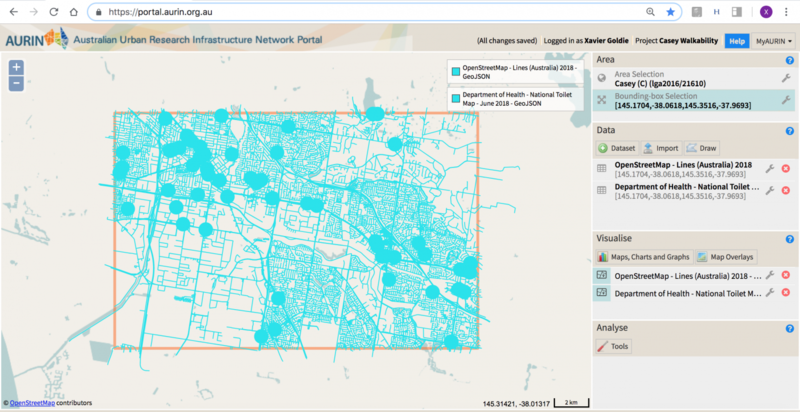 AURIN is the largest single resource for accessing and interrogating thousands of datasets, spanning the physical, social, economic, and ecological aspects of Australia’s cities, towns and communities. 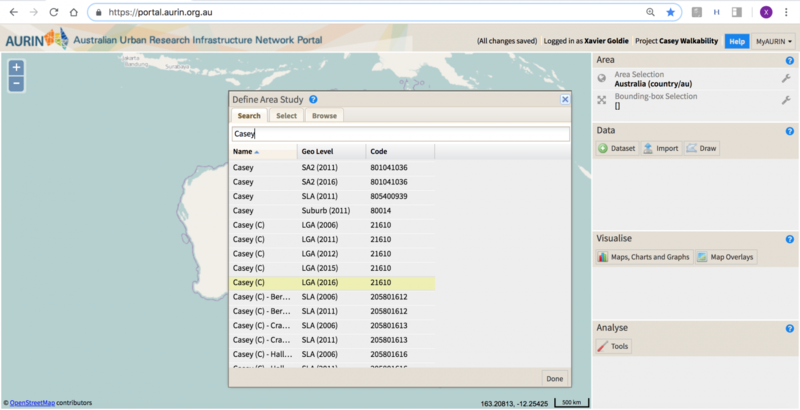 The AURIN Portal is AURIN’s flagship tool on the Workbench – it is an online data browser, visualisation and spatial analytical platform. It is completely free to use for any university staff member or student, and for any government employee, across Australia. 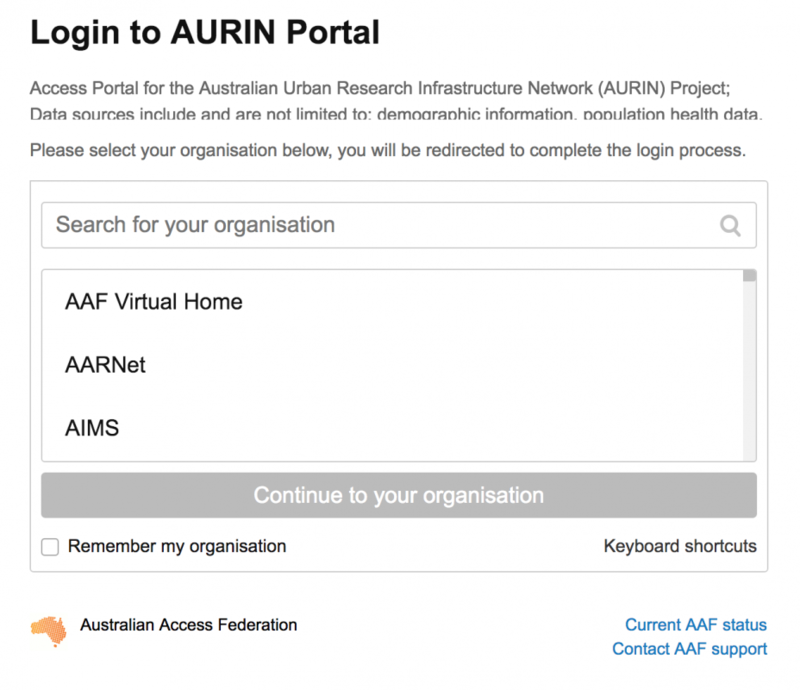 The AURIN Portal has been designed to integrate into a researcher’s existing research ecosystem, meaning data can be downloaded or uploaded as the user sees fit. 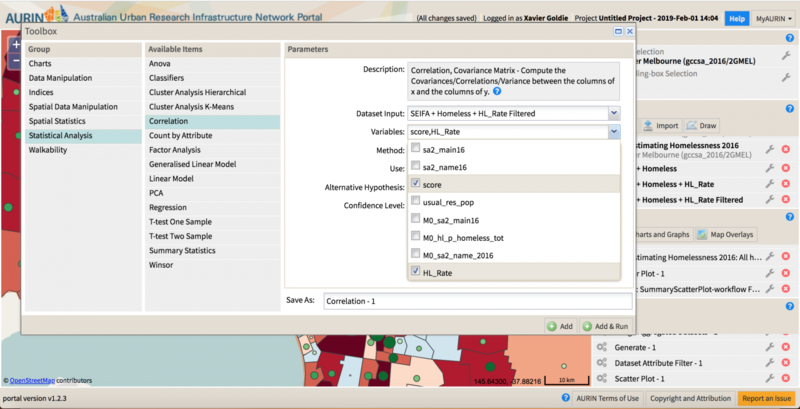 However, if you wish to work within the AURIN portal, there are over, 100 analytical routines ranging in complexity from basic statistical and visualisation techniques to complex spatial statistical routines. 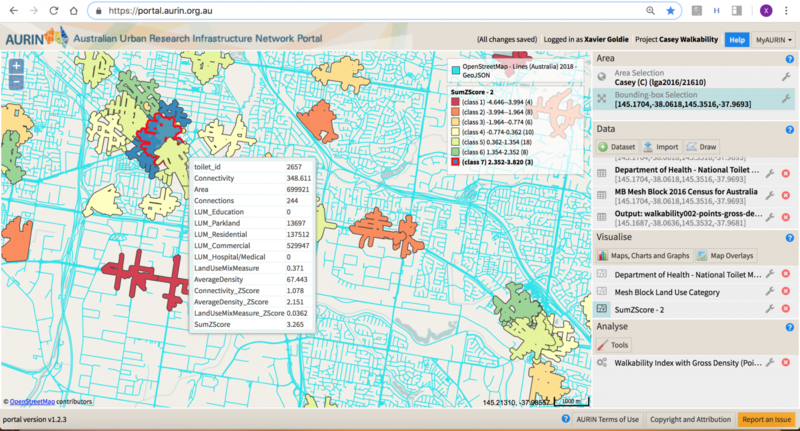 There are also bespoke analytical tools, including neighbourhood level walkability analyses. Please note that within this tutorial, there are a number of links (in AURIN Blue) to specific user guides for each Portal tool used. Please click on the links to get specific instructions for each of the tools. Important parts of the tutorial are highlighted in AURIN Orange. 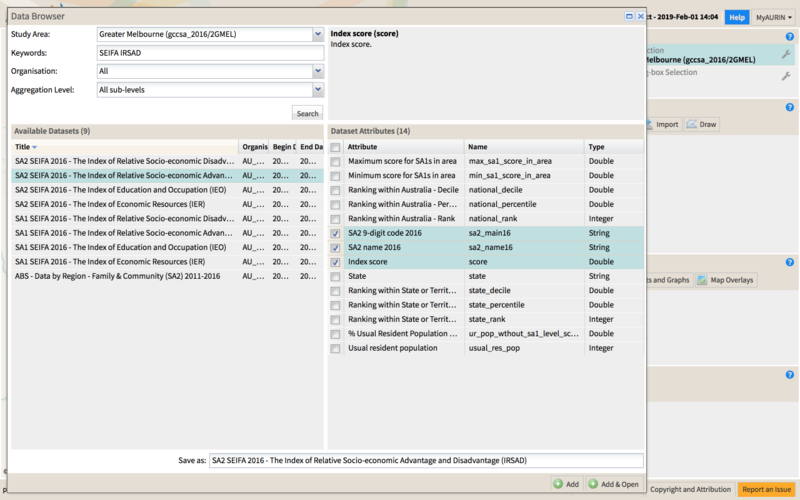 In this section we are going to use view two of the sets of resources available for the AURIN workbench, prior to logging in to the AURIN Portal. We recommend that you explore datasets within the AURIN data catalogue before diving in to the AURIN Portal to search for data. While a data search in the Portal is a seamless component of the workflow, it can be much easier to find specific datasets in a site dedicated to being a data catalogue! In these pages, you will find specific user guides for each and every tool on the AURIN Workbench. In addition, we have a collection of tutorials (like this one!) which provide useful examples of how to join a range of tools together for a full work flow, as well as exploring how to undertake interesting investigations of the thousands of datasets in the AURIN Workbench. We recommend that you bookmark both of these sites now, so that they are at your fingertips when you need to do some pre-Portal groundwork in the future – or if you get stuck! Please note that the AURIN system is best supported by Firefox, Chrome or Safari. If you are not a member of the above list – that is, if you work for a government organisation you will need to have requested and set up an account with us. You can register here. You will then receive a registration email from the AAF asking you to verify your account. Now that we are in the Portal, and familiar with the layout of the interface, it’s time to do some work! 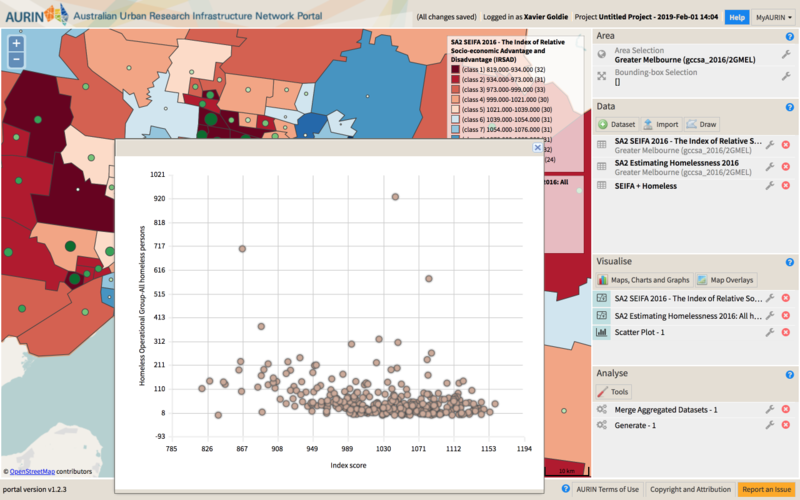 Selecting an area of inquiry will allow you to discover, extract, analyse and visualise the data that you’re interested in. 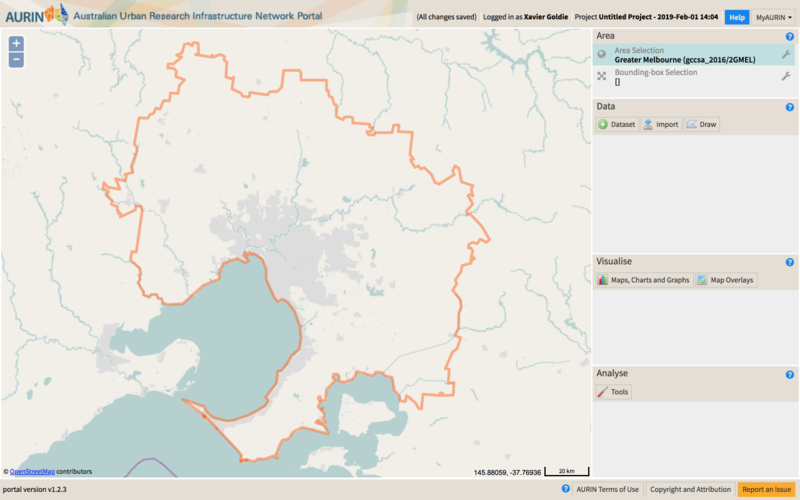 When you log in to the portal, your project will start with Australia selected as your highest level of geography. 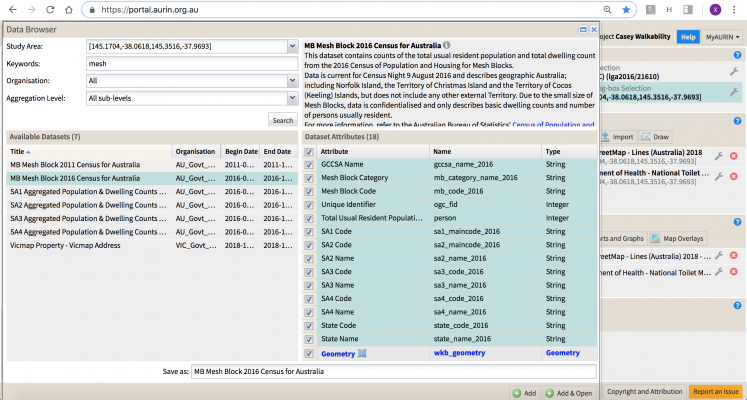 In this method, you move further and further down the nested geographies of the Australian Bureau of Statistics until you have found your area of inquiry. 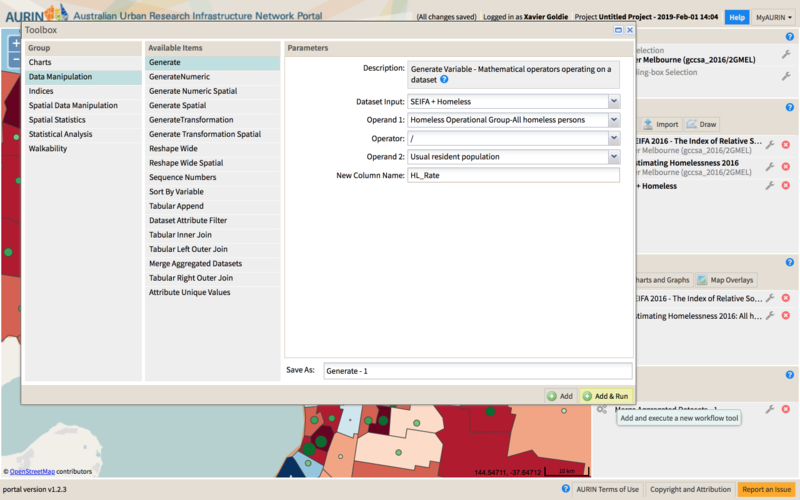 In this tutorial, we will be moving down the options until we come to 2016 Greater Melboure Capital Statistical Area (Greater Melbourne GCCSA 2016). You can also interact with the map itself at this stage, clicking on the areas, further breaking them down into their constituent parts. After selecting your area of analysis, you now need to bring some data into your AURIN portal session to visualise, interrogate and analyse. 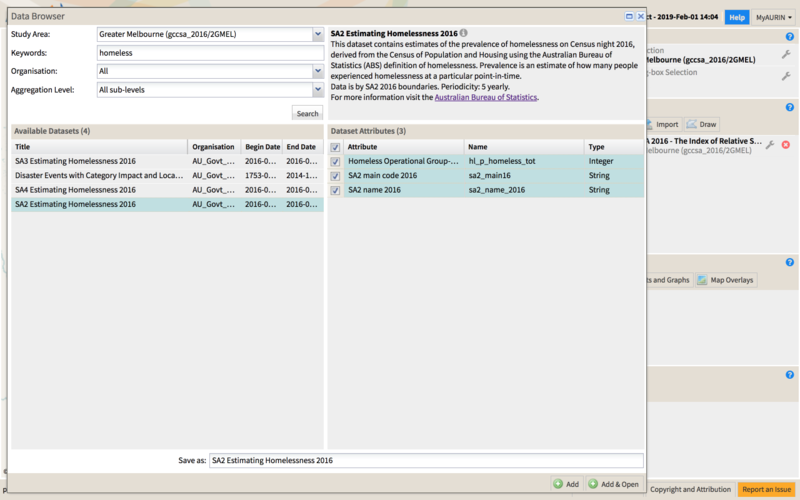 When you select a dataset (shown below), the dialogue box will then require you to select the attributes you want for the data – the three shown in the image below (you can also select all of the attributes by clicking the top left check box next to Attributes) The abstract for your data is provided in the top right of the Data Browser window. 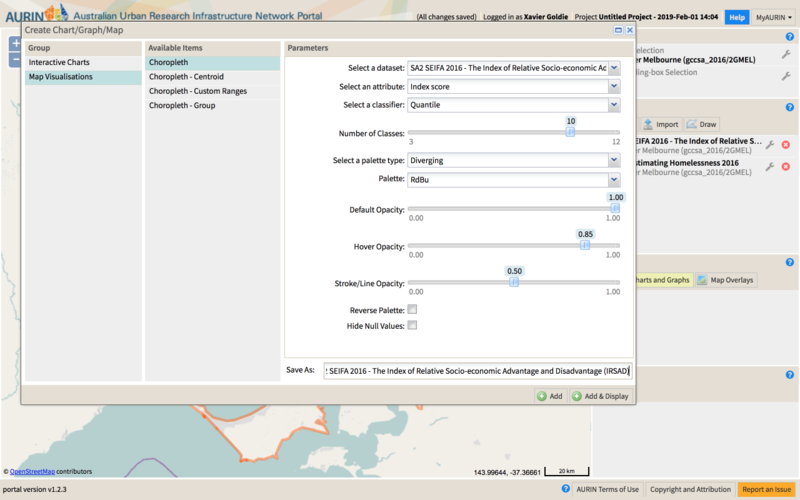 This will add the dataset to your Data panel, and it will open up the table for your perusal. You can sort the columns by the values by click on each column header. 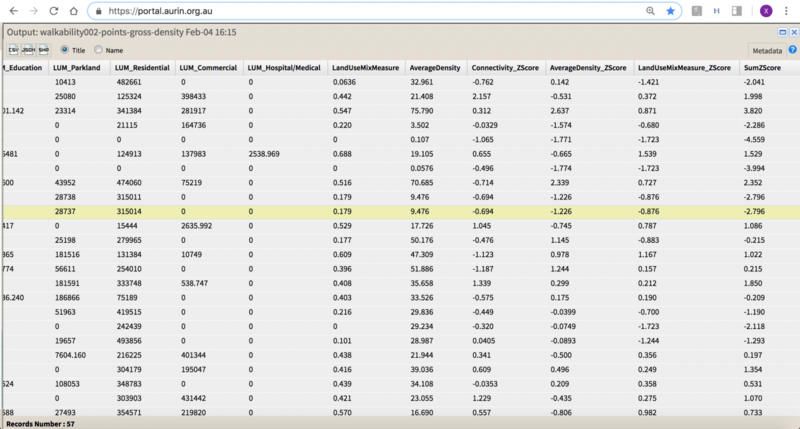 You can also download the dataset directly to your desktop in .csv (comma separated values) if you prefer, by clicking the small “CSV” icon on the top left of the table. A choropleth map is likely to be the most common kind of map visualisation that AURIN users will make with the data that they access. A choropleth (from Greek χώρο (“area/region”) + πλήθος (“multitude”)) is a thematic map in which areas are shaded or patterned in proportion to the measurement of a variable being displayed on the map. 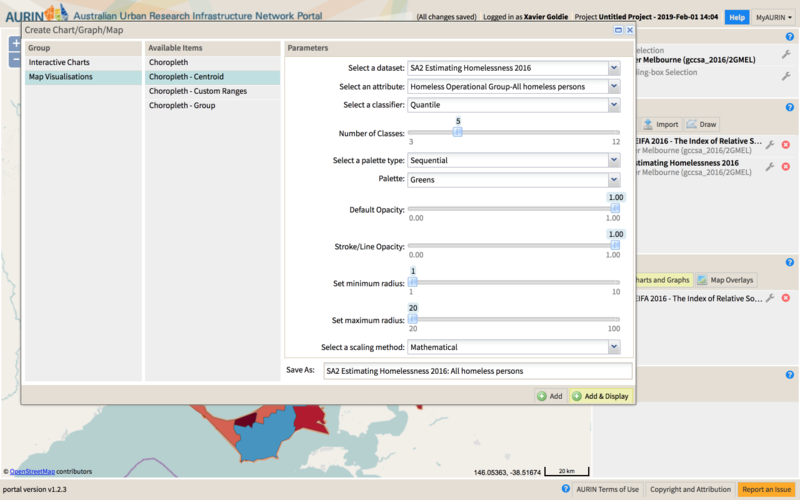 We are going to create a choropleth map of our SEIFA IRSAD data. 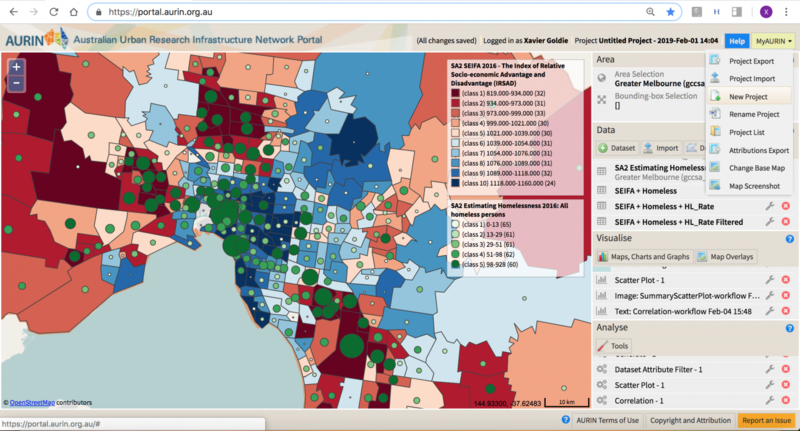 This will create a map of the SEIFA IRSAD score across Melbourne’s SA2s at the 2016 Census, which should look like the map below. You can hover over each of the areas to bring up its SEIFA IRSAD Score. Also, if you open up the table of data (by clicking on the little table icon), you can hover over each row and they’ll show up on the map, and vice versa. 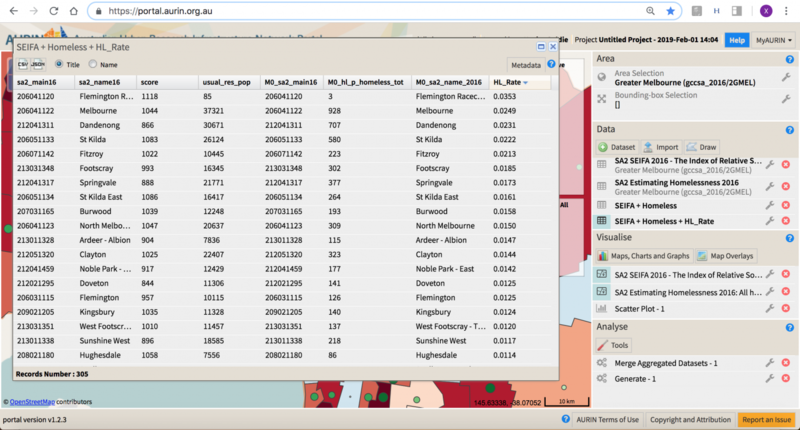 Choropleth centroid maps are another common type of AURIN visualisation tool. Similar to classic choropleth maps, choropleth centroid maps differ in the central point (“centroid”) of an area (“polygon” on a map is represented, with varying colour and symbol size, rather than the entire area being shaded according to the variable. 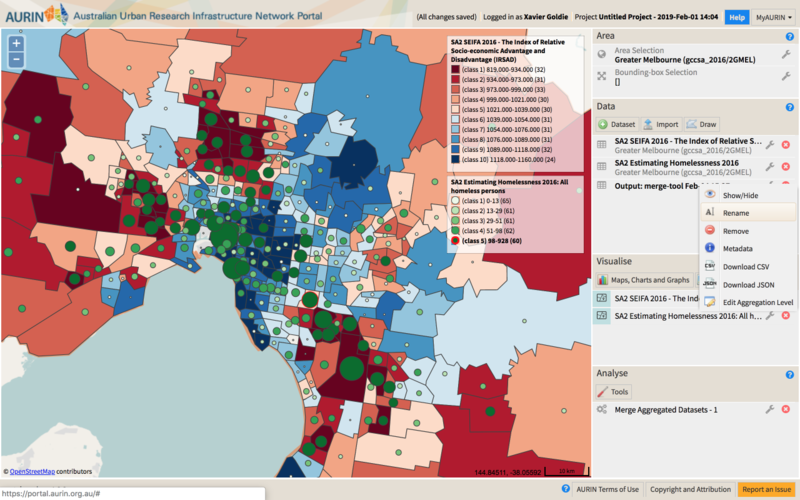 We are going to create a choropleth centroid map of our homelessness data. Research Question: Do you think there is a relationship between the number of homeless people, and the socio-economic score of an SA2? Once you have clicked Add and Run this will execute the tool. When it as finished running, you can view the new table by clicking on the Display button that pops up. You will see a new table that has both of the old tables in it unified across rows (SA2s). We will create an interactive scatterplot of an socio-economic status and estimated numbers of homeless people across Melbourne SA2s. 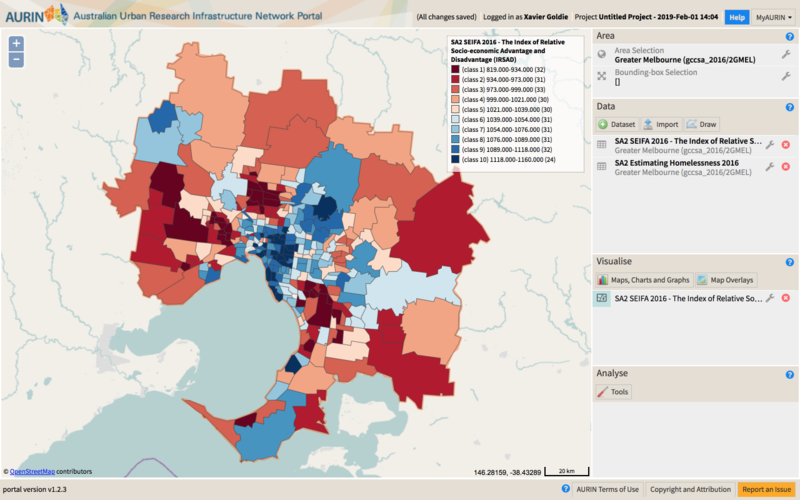 Once you have run the tool it produces a scatter plot as shown below, showing the relationship between SEIFA IRSAD Index Score and the estimated number of homeless people for SA2s in Melbourne. You can resize the chart and hover either the points on the graph or the SA2s on the map and they will show up on the other component. Question: Do you think there is a relationship between the two variables from this scatterplot? What other tools might we need to determine this? Are there other factors we need to think about when we consider this relationship? One of the issues that we have with our data at the moment is that we are comparing the total number of homeless people in an SA2 with socio-economic status. At this point, we would need to standardise the number to create a per capita rate, particularly if the number of homeless people is actually related to the total number of people in an area. To do this, we will need to create a new column of data that has homeless populations standardised by populations. 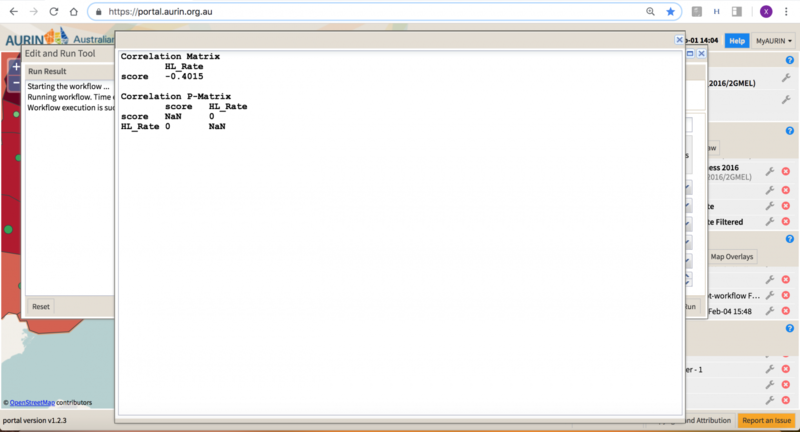 We will use the generate tool here to create a new table and column. Recall from the scatter plot that there are three outliers at the top of the graph which may unduly skew or influence our results. 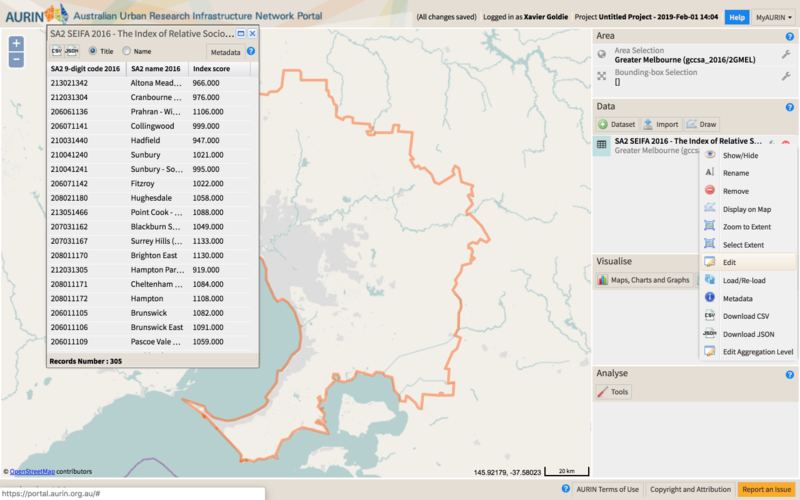 If you click the HL_Rate column to sort in descending order, these three SA2s (Melbourne, St Kilda, Dandenong) are in the top 4 of the SA2, along with Flemington Racecourse. We may wish to remove these four values from our table. Once the tool has completed running, a new table will appear in the right hand Data panel. You should rename this something like SEIFA + Homeless + HL_Rate Filtered. We may now be at a stage where we would like to create some imagery for a report or paper. Part of this would be to produce a scatterplot of the SEIFA Index Score versus the Homelessness Rate for our filtered SA2s. 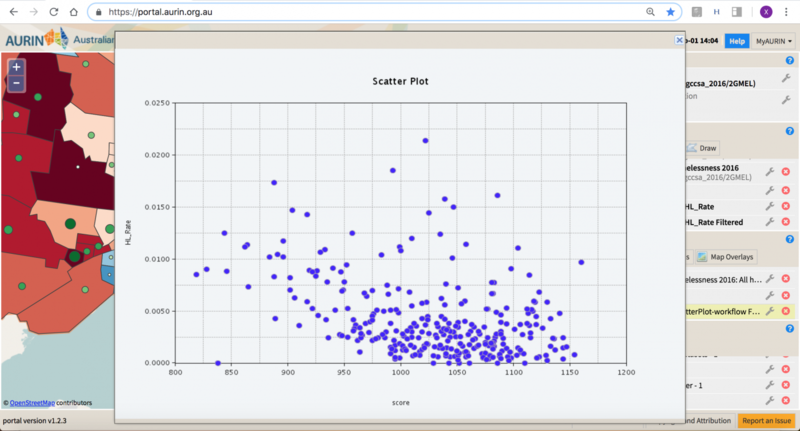 Rather than using the interactive scatterplot above, which can’t easily be placed into a report, the scatterplot chart tool can be saved easily as a .png format. Open up the tool (Tools → Charts → Scatterplot) and enter the parameters as you see them below, and click Add and Run. This will execute the tool. When it has finished running click Display and it will open up the resultant image as shown below. You can right click on this image and save it to the appropriate location on your computer for later use in a report. Up until now, all of our analysis of our data has been purely visual or interpretive in nature – that is, we have produced maps and graphs, but we have only done an “eyeballing” of the data and looked for patterns. Now we need to take our analysis one step further and undertake a statistical analysis that removes visual bias from the equation and runs a statistical test on the data. We will undertake a very basic statistical analysis – a correlation analysis, which generate a correlation co-efficient that will tell us the strength and direction of any relationship between our two variables, and whether or not it is statistically significant. Make sure to keep the other parameters (Method, Use, Alternative Hypothesis, Confidence Level) as the default values. Once the tool has run, click on the Display pop up that appears. It should look something like the image below. This correlation coefficient value of -0.4015 shows a moderately strong negative relationship between SEIFA IRSAD Index score and the rate of homelessness across Melbourne’s SA2s at the 2016 Census. This means that as disadvantage decreases and advantage increases, the rate of homelessness in those SA2s decreases. It is also statistically significant. 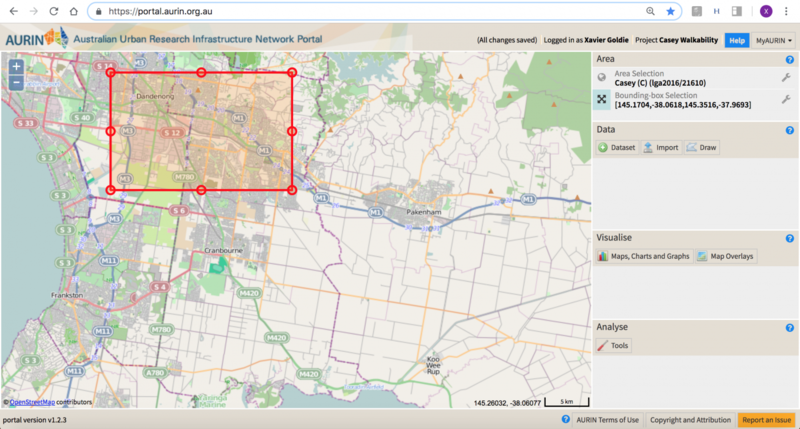 We are now going to switch gears completely and undertake some spatial analysis at a much finer scale. We are going to investigate walkability in a new area. Firstly, select the City of Casey as your study area. 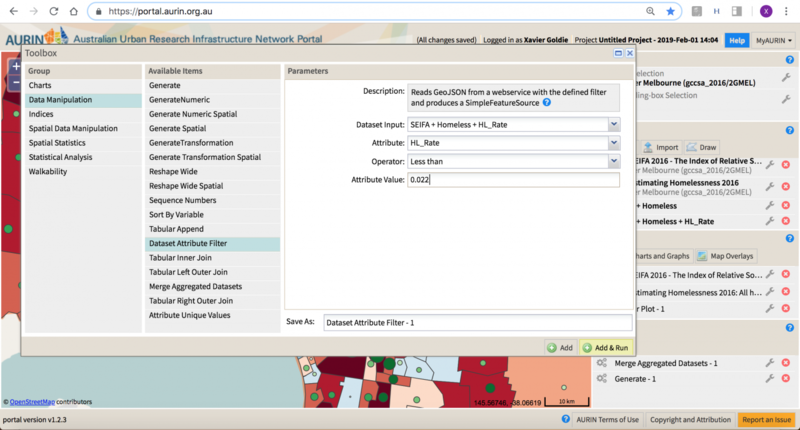 Do this by clicking on Area Selection and searching for Casey (C) 2016 LGA boundary as shown below. When you are finished click done and your portal should look like the second image below. Now we will create a bounding box that encompasses the northern part of this area. 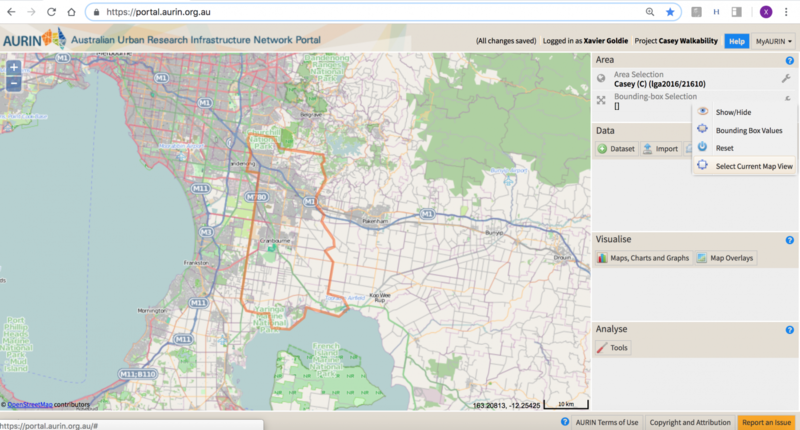 To do this, click on the spanner next to the Bounding Box option under the Area panel, and then Select Current Map View. This will ‘activate’ the bounding box, which you can drag around and reshape, so that it’s where you want it and the size that you want it (shown below). 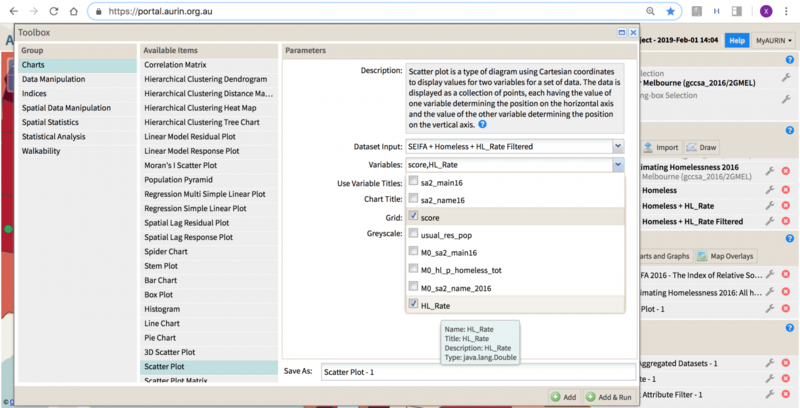 The advantage to this method is that it does not then restrict the datasets that are available based on geographic hierarchies – every dataset that intersects or is within that box will come up in your data search when you run it. Once you have selected your area, make sure to click Done. This will remove the active edge and vertex circles and lock in the bounding box. At this point you might want to change the base map to one that has fewer colours on it, so that you can see your data more clearly. To do this, click on MyAURIN and then Change Base Map shown below). 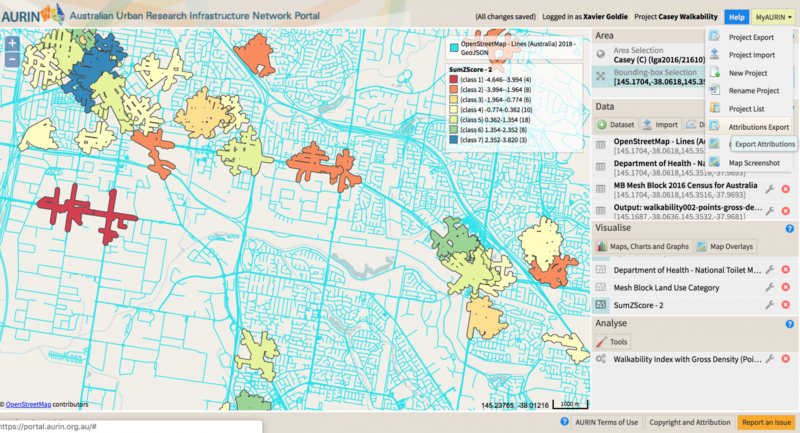 Now we need to bring some datasets into calculate our walkability. Firstly, you will need a street network. 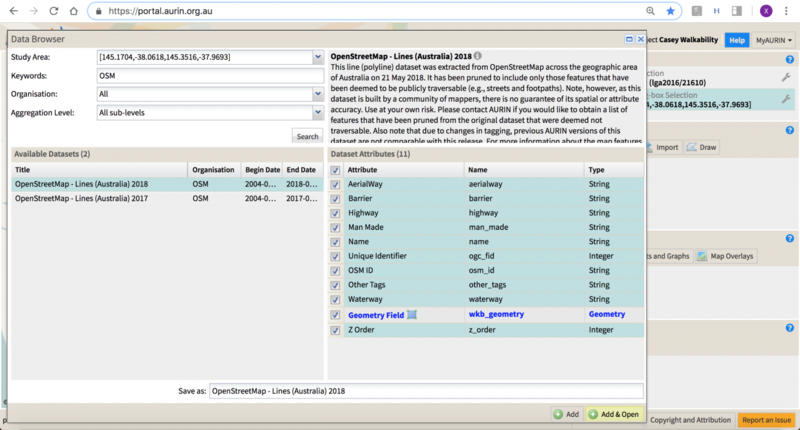 Add and open the OpenStreetMap – Lines (Australia) 2018 making sure that you add the blue geometry attribute (shown below). 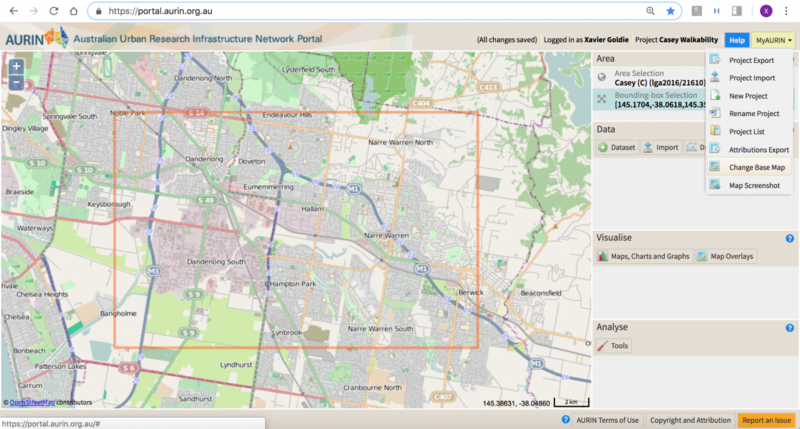 Secondly, we will add a point level dataset around which we will measure the surrounding walkability. For this, select the Department of Health – National Toilet Map – June 2018 dataset. Again, at the minimum, the blue geometry attribute must be selected. At this point, you may want to have a look at what these datasets actually look like. 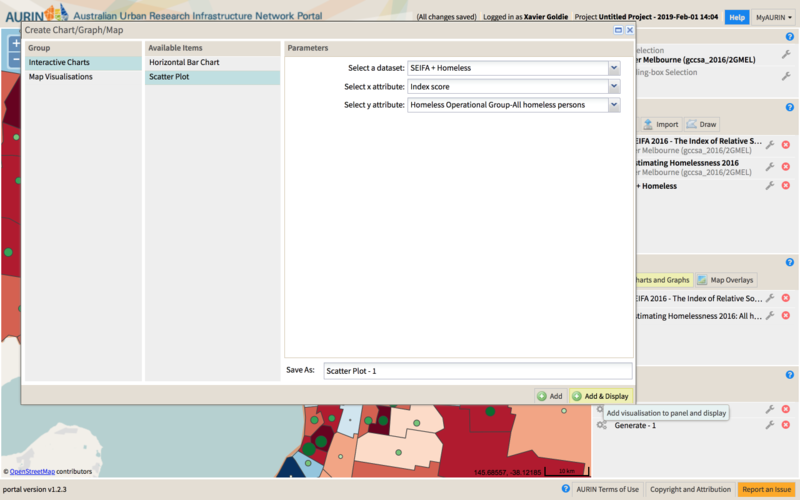 For each of them, click the spanner next to the dataset in the data panel, and click Display on Map (shown below). 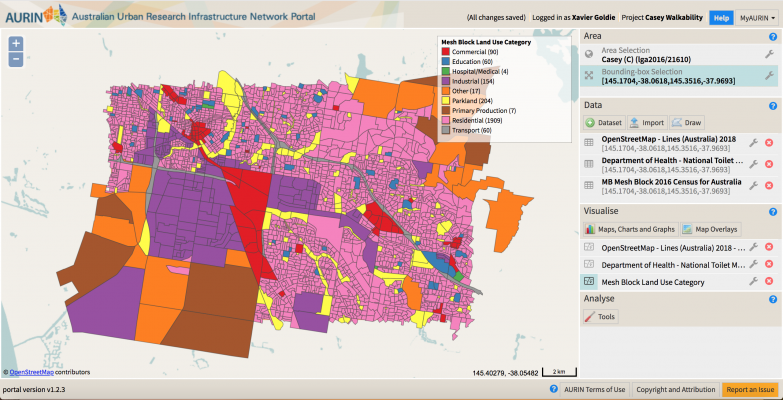 This tool is a “sandwich with the lot” combining the three composite elements of the built urban form – connectivity, land use mix and population density – to provide you with a comprehensive walkability index for your areas in a single step. Open the tool (Tools → Walkability → Complete with with Gross Density (Points)) and enter your parameters as shown below. These are also explained under the image. Trim Distance: The width (in metres) of buffer to be applied to the traversable line, network segments. We select 50 for this analysis. AverageDensity: The average population per hectare for each of the catchments. XXX_ZScore: These are the scores for the three different components (connectivity, land use and average density) converted into Z scores, where the mean for the different catchments is zero, and the numbers indicate how many standard deviations each score is above or below the mean. Essentially, the more positive the number, the better relative score for that attribute, and the more negative number, the worse relative score for that attribute. We recommend that you make sure you have a relatively large number of observations (a minimum of 30) before using Z scores in any discussion, as they rely on robust mean and standard deviation calculations, which are less reliable at smaller samples sizes. We are now at a point where we may want to embed our walkability map into a report. 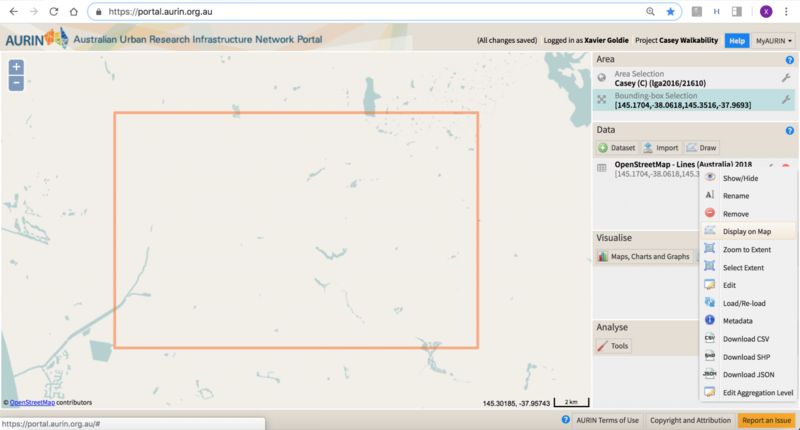 You can create a high resolution screen shot of your portal session now by clicking MyAURIN and then Map Screenshot, shown in the image below. This will download automatically to your desktop. Even the most permissive license on the AURIN Workbench requires you to cite where the data was sourced from. 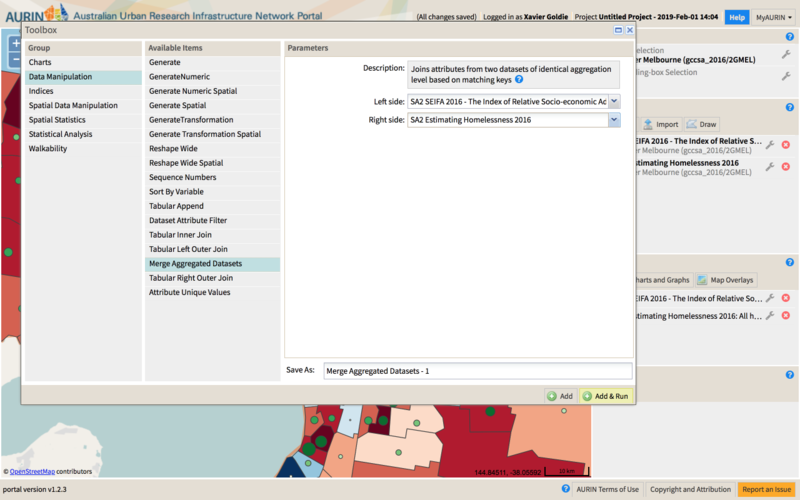 To download a list of the appropriate citations for all datasets that you accessed in your AURIN Portal session, click on MyAURIN and then Attributions Export (shown in the image below). This will download a zipped folder that contains a text file (.txt) with the list of citations and a .ris file which can be loaded into bibliographic management software such as EndNote.